Part 3 is double crochet visual and written for beginner crocheters. 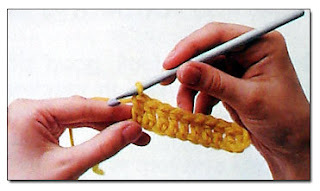 Make any number of chain stitches, and make two more than the number of stitches (such as, you will need 32 stitches for a 30 chains. Wind the yarn around the hook. Insert the hook from the front to back into the 4th chain from the hook. 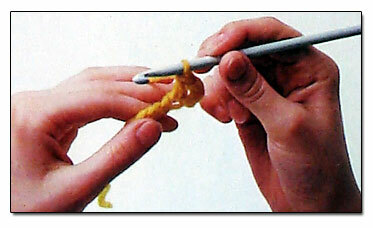 Wrap yarn around the hook once (this is called a "yarn over") and draw through a loop. You should have 3 loops on the hook now. 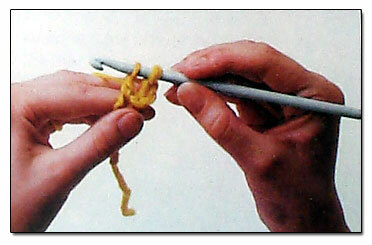 Wind the yarn around the hook and draw it through the first two loops on the hook. Two loops remain on the hook. 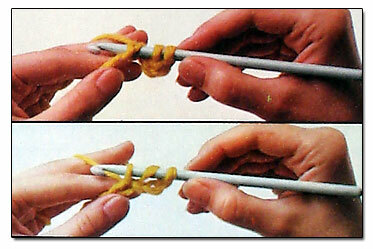 Wind the yarn around the hook and draw it through the last two loops on the hook. One double has been made. Work one double in the same way into each chain to the end of the row. Now you are ready to turn it around and double crochet the next row. To turn the row which make 3 chain stitches. 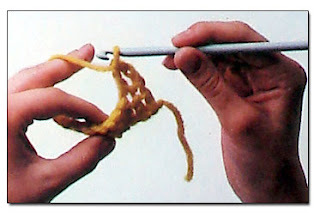 The three chains count as the turning stitch and are equal in height to one double crochet stitch. Skip the first stitch. Work the first double into the second stitch. Work into each double to end, working the last double into the top of the turning chain of the previous row. Continue to work in this way for the number of rows you need. Fasten off. 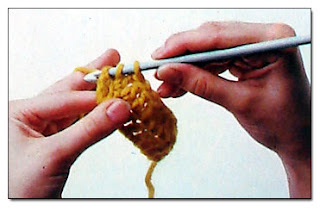 Note: Since the double crochet is a much longer stitch than a single crochet, it is necessary to work three turning chains at the beginning of every row. Work the last stitch of every row into the top of the three turning chain of the previous row to keep the edge straight, and to prevent pulling the work out of shape at the side edge.